Why You Should Tip Your Hairdresser, Generously. “I look like my mother,” I said to my hairdresser, Lola, as she was preparing to cut my wet hair. “All woman say that when their hair is wet,” she said. “Wow, that’s interesting,” I responded. “You should write a book on women.” The blogger in me kicked in and I asked Lola to share some other things she’s learned from her days of coloring, cutting and blowing. “Well, for starters,” she said, “one time we talked about how we would kill some of our clients. She picked up her scissors. “Interesting,” I said. Thank God, I didn’t complain when she took me a bit late. “I thought I might like cutting into someone’s throat,” she said, “just like this! Swish!” I looked in the mirror and saw her pretend swipe across my throat. “Cute.” I said as I calculated previous tips I had given to Lola. Were they enough? 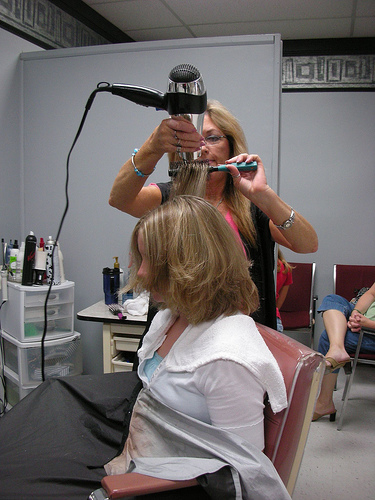 “Then there’s the flat iron,” she bent my head forward so she could work on the hair on the nape of my neck.”When it’s hot, the flat iron reaches a temperature of 450 degrees.” She put down the scissors and waved the flat iron around. I could see she was definitely warming to her subject. “Is that the same as a curling iron,” I asked. I remembered the time I forgot to call and cancel my appointment. “No, the flat iron is definitely the way to go if you want to kill a client.” She really was warming to her subject. I looked at her array of brushes,scissors and irons on her counter top. I don’t think I ever gave Lola a Christmas present. Lola finished. I gave her a generous tip, and escaped to my car, happy to be alive. This Christmas, things would be different. I too heard the laments of my hairdresser this past week as I sat in the “turkey baker,” this contraption used to “cook” my color. She is an adorable young woman, Armenian, who has lots of Armenian clients who drive her crazy. She was telling me how they want everything at a lower price. They always want to negotiate the price down. She said they often make her cry as they are so critical of her. “Why can’t the Armenian women be more like you American women, so sweet and kind.” I left her an additional $20.